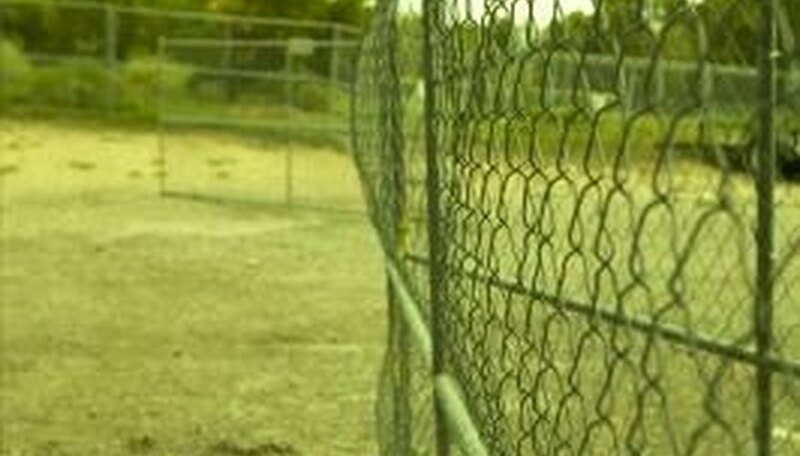 If you own a chain link fence, you may decide that you want to move it. Whether the fence is over your property line, or maybe the fence was installed badly, you can actually pull chain link fence posts and reuse them. Though it isn't technically challenging to dig out a fence post, it can be hard work, especially if your posts are set in concrete. Just be sure to avoid damaging the posts if you try to remove the concrete anchor that holds them in place. Remove the top cap attached to each post. Place the edge of a flat-head screwdriver beneath the lip of the top cap. Tap the handle end of the screwdriver upwards with a hammer to pop the top cap loose. Repeat for all remaining posts. Unscrew the brackets attached to each post. Loosen the bolts on the brackets with a socket wrench and an adjustable wrench. The chain link fence will fall to the ground. Roll up the chain link fence and set aside. Slide the brackets up the length of the post and remove. Dig a hole around the base of the fence post. If your posts are not set in concrete, you can probably wiggle them loose after you dig away about 6 inches of soil. Push and pull the post back and forth in the hole until it begins to separate from the soil. Pull the post up and out of the ground once it moves freely in the soil. If the post is set in concrete, you will need to proceed to the next step. Continue digging around the concrete base of the fence post. Most fence posts are set between 24 and 36 inches in the ground, so you need to dig out at least 24 inches on one side of the post. You don't have to dig out the entire concrete base, but be sure to dig out a hole at least 24 inches deep on one side. Walk around to the opposite side of the fence post from the hole. Push the fence post down and towards the hole. The concrete base will pivot into the hole, and the post will lie almost parallel with the ground. Chip away at the exposed concrete base with a sledgehammer. Refrain from using too much force or else you could bend the post. Once you have knocked away a large amount of concrete from the post's base, grab hold of the post and pull it up and out of the hole. If you don't remove some of the concrete first, the post will be extremely heavy, and you could injure yourself. Repeat the process above for all remaining posts. Once you have all of the posts above ground, you can continue chipping away at the concrete if you want, before reusing the posts. Check all of the posts and make sure they are not bent. Discard any bent posts.